2 El Subjuntivo Its all in the mood! 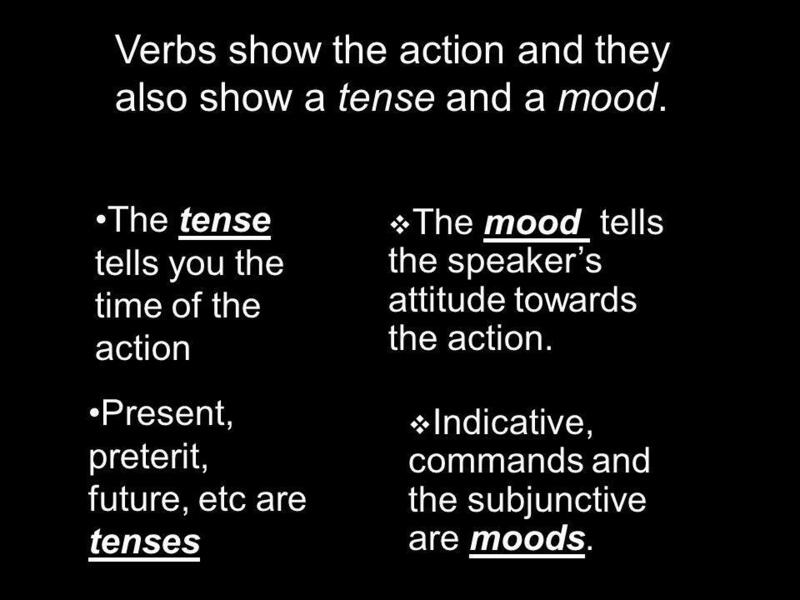 3 Verbs show the action and they also show a tense and a mood. The tense tells you the time of the action Present, preterit, future, etc are tenses The mood tells the speakers attitude towards the action. 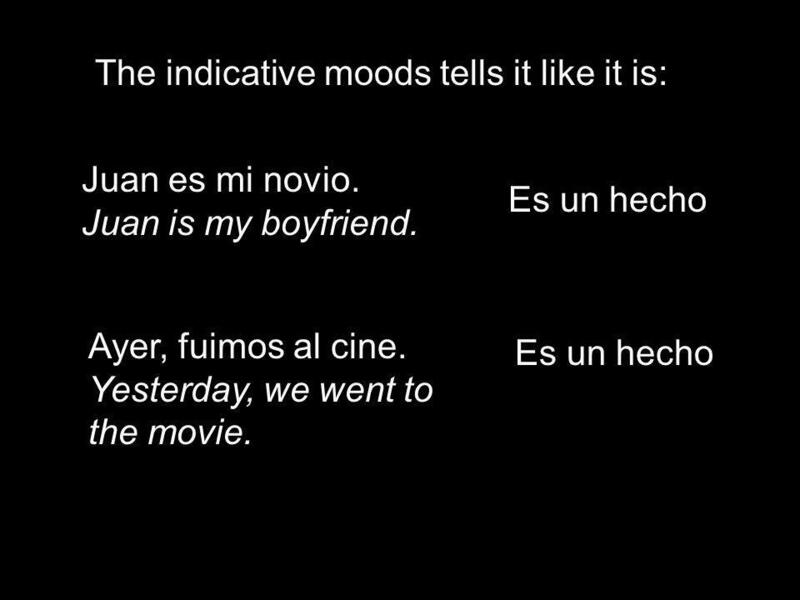 Indicative, commands and the subjunctive are moods. 5 ¿Qué es el subjuntivo? 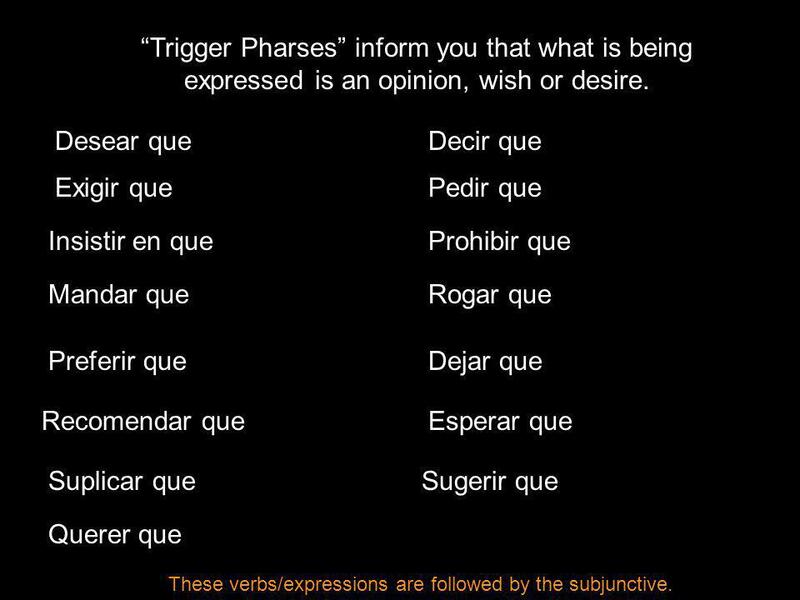 It expresses an opinion, wish, desire, want, gives an order, influences, persuades or forbids Ej: Es important que tú bebas 8 vasos de agua cada día. You are told to drink water by the persuasion of its important that. 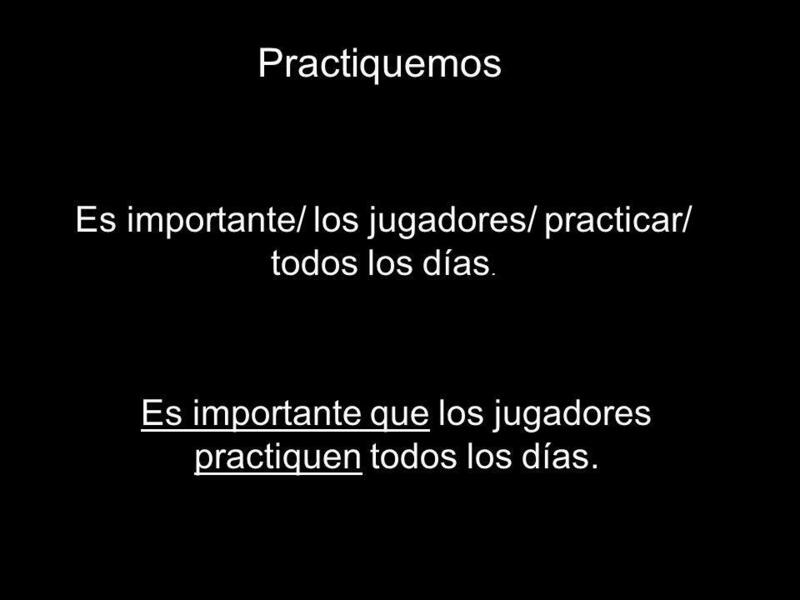 7 Practiquemos Es importante/ los jugadores/ practicar/ todos los días. Es importante que los jugadores practiquen todos los días. 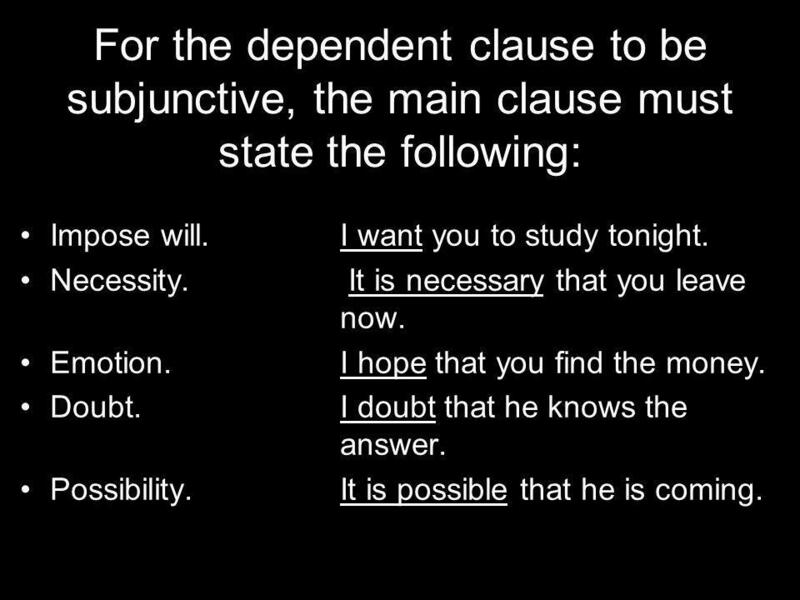 10 For the dependent clause to be subjunctive, the main clause must state the following: Impose will.I want you to study tonight. Necessity. It is necessary that you leave now. Emotion.I hope that you find the money. Doubt.I doubt that he knows the answer. Possibility.It is possible that he is coming. 11 Trigger Pharses inform you that what is being expressed is an opinion, wish or desire. 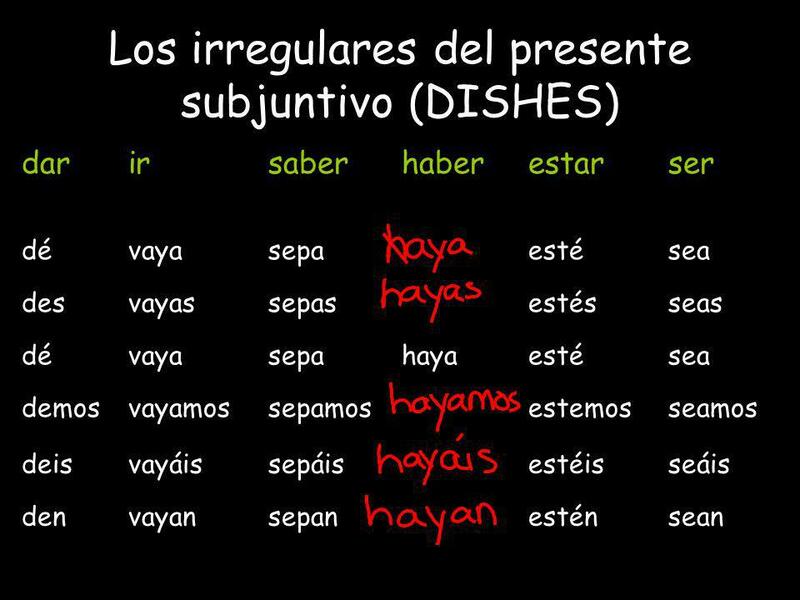 Desear que Exigir que Insistir en que Mandar que Preferir que Recomendar que Suplicar que Decir que Pedir que Prohibir que Rogar que Dejar que Esperar que Querer que Sugerir que These verbs/expressions are followed by the subjunctive. 12 Como se escribe el subjuntivo otra vez: 1. Trigger Phrase 2. Check for change of subject Espero que te sientas mejor mañana. Espero sentirme mejor mañana./ Espero que me siento mejor mañana. 3. 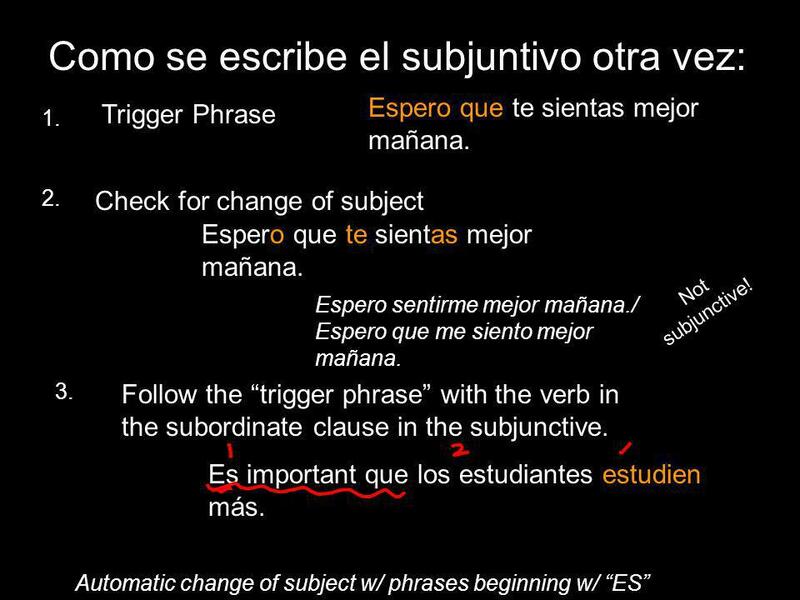 Follow the trigger phrase with the verb in the subordinate clause in the subjunctive. Es important que los estudiantes estudien más. 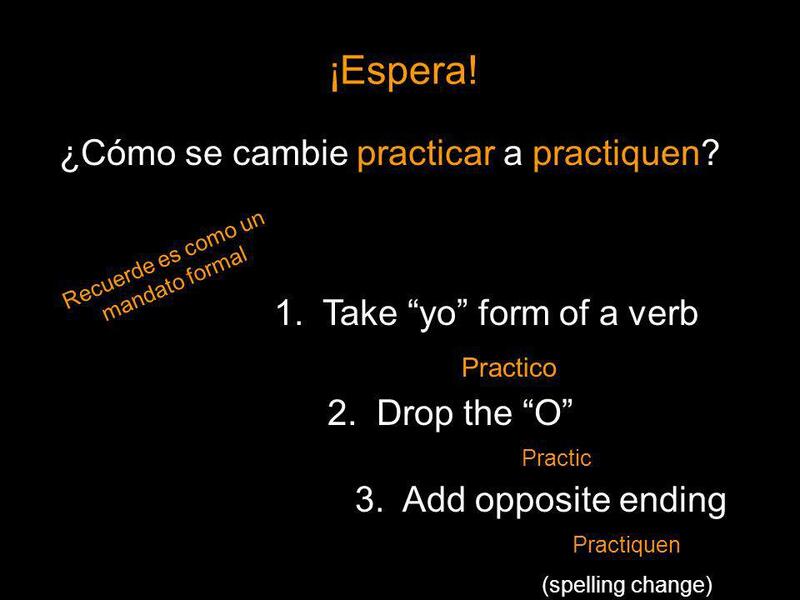 Automatic change of subject w/ phrases beginning w/ ES Espero que te sientas mejor mañana. 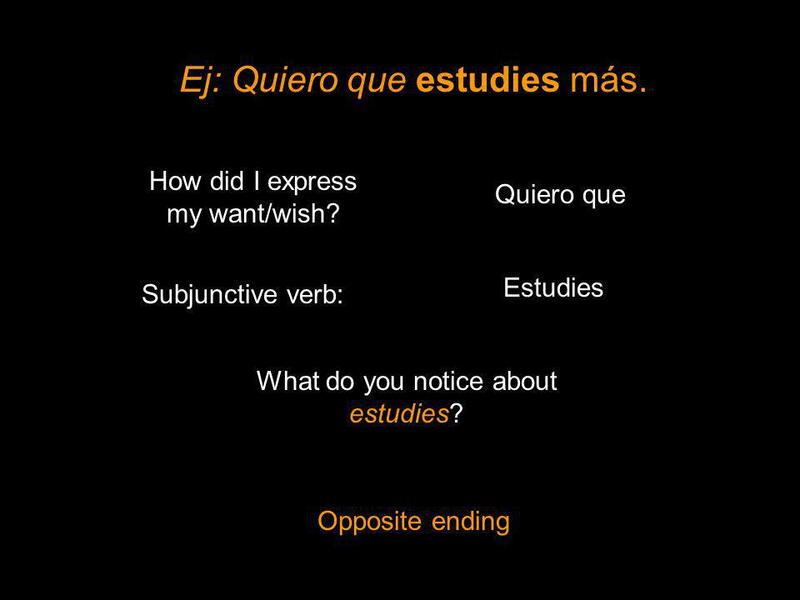 Not subjunctive! 13 Practiquemos juntos Ej 1: Esperar (yo)/ Juan/ ir/ al concierto. Ej 1: Espero que Juan vaya al concierto. Ej 2:Estoy feliz que Britney no esté enferma. Ej 2: Estar feliz (yo)/ Britney/no estar enferma. 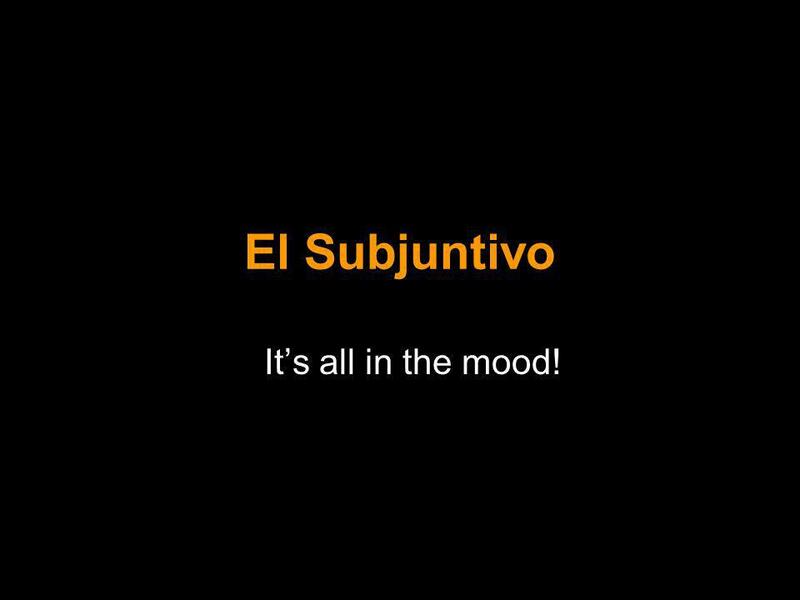 Descargar ppt "El Subjuntivo Its all in the mood! Verbs show the action and they also show a tense and a mood. The tense tells you the time of the action Present, preterit,"
Los Mandatos Commands in Spanish. With the exception of commands, all the verb forms you have been using have been in the indicative mood. 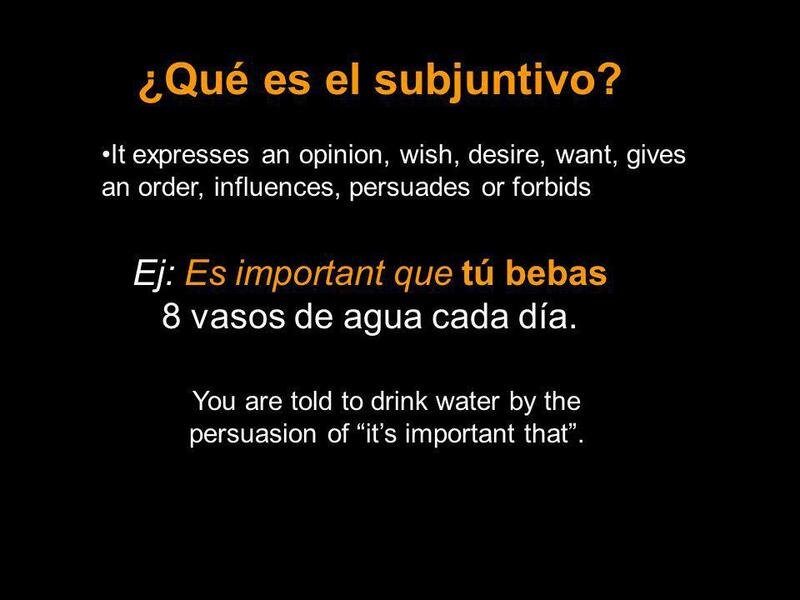 The subjunctive is not a tense; rather, it is. Gramática Nueva: ¿Cuál es? ¿Cómo se forma? Quiero que Uds. vengan a mi fiesta. Pido que hagas la tarea. Espero que tenga un buen fin de semana. Las chicas.